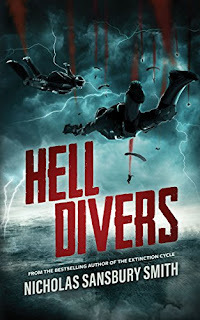 Hell Divers (The Hell Divers Trilogy Book 1) by Nicholas Sansbury Smith. From just looking at the cover and reading the title I knew this book was going to be special, and my gut feeling did not let me down. The book is set in a post-apocalyptic world where earth having been ravaged by nuclear attacks have left it in a permanent state of toxic radiation and electrical storms. Humanity are on the very brink of extinction and all who remain reside inside two airships that hover above the storm clouds. But the problem is that the airships need fuel to run and the only the way to get it is by going back to ground and so in order for depleting resources to be replenished it requires brave individuals willing to venture beyond the electric storm clouds and descend upon a toxic earth, and these individuals are better known as - Hell Divers. In terms of the beginning chapters, I'm struggling to think of a book that instantly packed such adrenalin filled action and excitement than this book. I don't think I had time to breath during the 1st chapter because I was so hooked on the suspense and anticipation of the Hell Divers as they jumped down to Earth. The story focused on the main protagonist, Xavier, or X for short, who performed more dives than any other person. The average lifespan for a Hell Diver is about 15 dives and X has completed 95 jumps. He is a tough, resilient character but at the same time showed tremendous loyalty to his people. In a nutshell he's my kind of main character. I thought the premise of the book was unique (for me at least) and I really enjoyed the world that the author created. Smith writes in simple but effective words that easily paints what's happening. I really enjoyed the tension he imbued when describing the mutated creatures that live on the ground. If you want to enjoy an action packed post-apocalyptic novel with a unique/interesting concept then this book is a must. One of the best opening intros that I've read for a long, long time. Just read the books sample to understand what I mean.